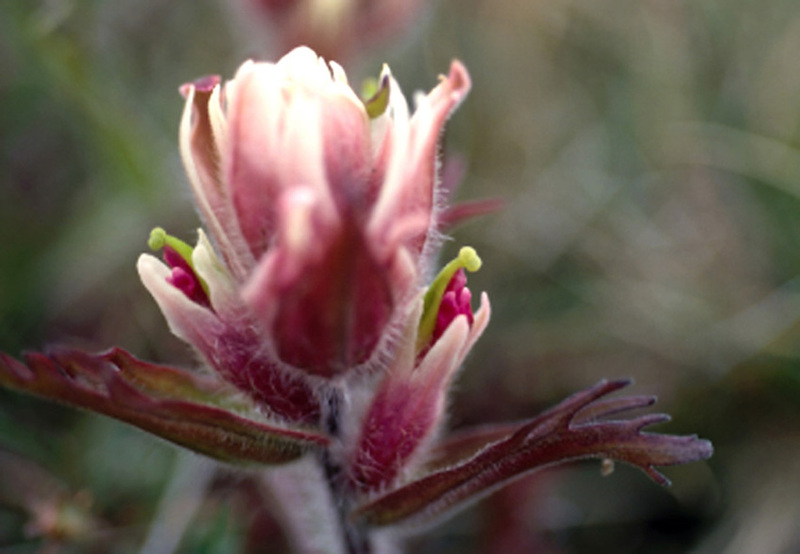 Flora of the Canadian Arctic Archipelago - Castilleja elegans Ostenf. Published in In Malte, Rhodora 36: 187.1934. 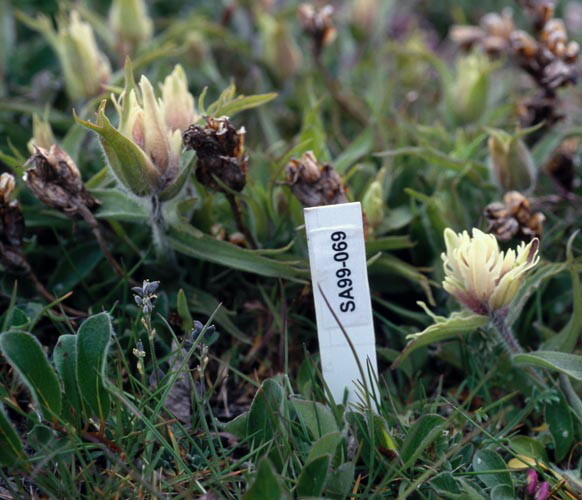 Type: Canada: Nunavut, South coast of Coronation Gulf, mouth of Tree Rivers, Approx. 67°04'N, 111°53'W, J.R. Cox and J.J. O'Neill, 433. 19 July 1915. Holotype: CAN 98899. Synonymy. 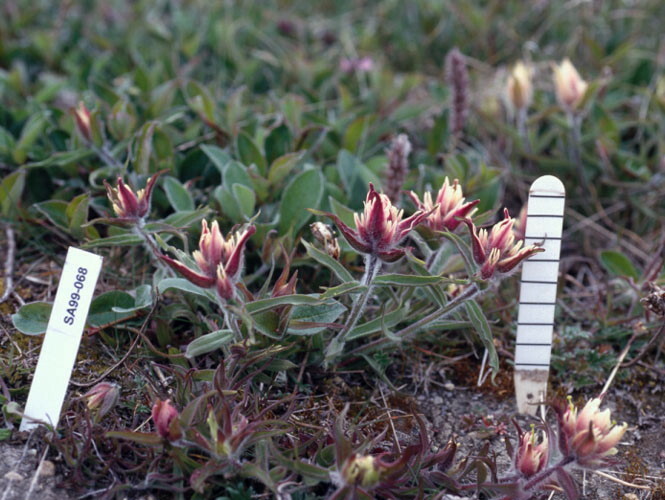 Castilleja pallida (L.) Spreng. subsp. elegans (Ostenf.) Pennell, Proc. Acad. Nat. Sci. Philad. 86: 526. 1934. Vegetative morphology. Plants (8–)15–25 cm high; perennial herbs; caespitose, or not caespitose. Taproot present. Ground level or underground stems horizontal. Caudex present (robust at ground-level in older plants, tapering into a major root or branching into many roots). Aerial stems ascending, or decumbent. Aerial stem trichomes present; spreading, or erect. Leaves heterophyllous (basal leaves often with pinnate lobes, leaves near the inflorescence entire); distributed along the stems; alternate; dying annually and non-persistent. Petioles absent. Leaf blades simple. Leaf blade bases truncate, or attenuate. Leaves not grass-like. Blades 20–40(–50) mm long, 1.5–7 mm wide, spreading to divaricate, straight, linear or lanceolate, flat, veins parallel. Blade adaxial surface hairy, hairs pubescent or pilose, hairs simple, hairs sparse (towards the leaf tip) or dense (near the stem), hairs white, or translucent. Blade abaxial surface hairy, hairs woolly, hairs very dense, hairs white, hairs wavy, hairs spreading (hairs long near the leaf axils; short and more sparse towards the leaf tip). Blades not lobed (for most of their length) or cut into linear divisions (sparsely and irregularly near the base). Blade margins deeply divided (if applicable), with non-glandular hairs (floccose hairs may appear glandular), with teeth toward the apex (if applicable); apices acuminate. Reproductive morphology. Flowering stems two or more per plant. Flowering stems circular or oval in cross section. Flowering stems with leaves. Flowering stems hairy. Flowering stems woolly. Flowering stem hairs simple; longer than the diameter of the flowering stem; white or translucent; glandular hairs absent. Inflorescences spicate, or head-like (especially smaller inflorescences); lateral; dense; 2–6 cm long; 25–35 mm wide; elongating as the fruit matures. Pedicels absent. Flowers medium-sized; bilaterally symmetrical (zygomorphic). Sepals conventional; (4–)5; fused; 17–20 mm wide; yellow (cream), or pink; petaloid. Calyx tubular; 5-lobed; hairy. 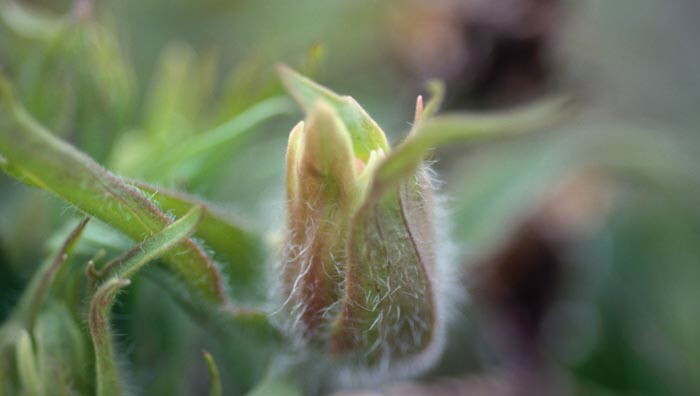 Calyx hairs woolly; white or translucent. Calyx margins ciliate. Petals conventional; fused; 5; white, or yellow (cream), or pink (deep purplish); with contrasting markings (a gradation of colour from pale tips to deep pink at the base of the pink-coloured form), or without contrasting markings (all-cream form); 25–27 mm long. Corolla bilabiate; 3-lobed (landing petals), or 2-lobed (helmet). Stamens 4; stamen filaments markedly unequal in length (attached to the corolla at different heights and with anthers lying in pairs, one on top of the other near the helmet petals). Anthers purple, or yellow; 1–1.5 mm long. Receptacle surface glabrous. Ovary superior; carpels 2; syncarpous. Ovaries ovate (to conical); glabrous. Styles 1; 15–25 mm long; straight. Stigmas per ovary 2. Placentation axile. Ovules per ovary few: 10–30. Fruit sessile; with calyx persisting; dry; a capsule; broadly lanceolate; yellowish, or brown; 10–11 mm long; 2.5–3.5 mm wide; glabrous; surface appearing veinless; dehiscent; opening at the apex and partially or fully down one side. Seeds few; 2–2.5 mm long; surfaces smooth (bubble-pack-like testa), spinose (centre). (2n) (2x) = 24. Zhukova (1966, Wrangel Island; 1982, northeastern Asia); Johnson and Packer (1968, northwestern Alaska); Dawe and Murray, in Löve (1981a, central Alaska). Ecology and habitat. Substrates: lakeshores, slopes (boulder ridges); imperfectly drained moist areas, seepage slopes, dry; sand; calcareous. Moist, calcareous tundra or rocky or sandy lake shores (Porsild, 1951). Well-drained sandy bar in modern floodplain; pioneer species (CAN 484859); open vegetation on calcareous stony, frost-heaved clay (CAN 220039); deeply dissected sandy ridges and slopes on south-facing hills (CAN 526861); dry tundra flat near lagoon (CAN 128081). North American distribution. Alaska, Yukon, Northwest Territories Islands, continental Northwest Territories, Nunavut Islands, continental Nunavut. Range in the Canadian Arctic Archipelago limited. Uncommon. Low Arctic. Arctic islands: Banks, Victoria. Northern hemisphere distribution. Amphi-Beringian. West Chukotka, Wrangel Island, East Chukotka, West Alaska, North Alaska  Yukon, Central Canada, Labrador  Hudson Bay. Illustrations. • Roots and base of plant. 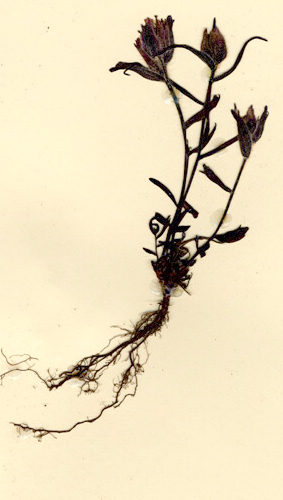 Base of young plants with small caudex zone and branching fibrous roots from a small taproot. CAN 485053. • Habitat. 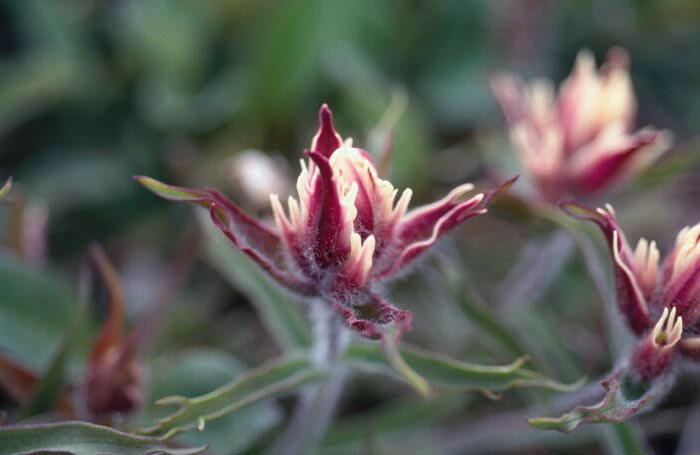 Plant with purplish bracts and petals, growing in sand. N.W.T., Banks Island, Sachs Harbour, in front of the Parks Canada House. Aiken 99–068. CAN. • Habitat. Note mainly cream bracts and petals. Plant growing in sand side by side with those in previous picture. N.W.T., Banks Island, Sachs Harbour, in front of the Parks Canada House. Aiken 99–068. CAN. 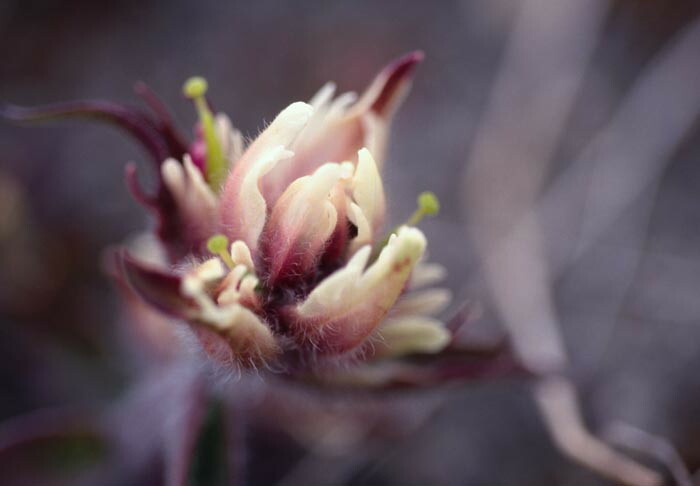 • Close-up of young inflorescence. Inflorescence surrounded by large bract leaves, the backs of which are covered with long white floccose hairs. Aiken 99–068. CAN. • Close-up of expanding inflorescence. Inflorescence surrounded by large spreading magenta bract leaves having occasional linear divisions that are pale in colour (seen on right-hand bract). Interior to the bracts, flowers opening with pale, asymmetrical calyces visible. Aiken 99–068. CAN. • Inflorescence surrounded by large spreading bracts. Inflorescence surrounded by large, spreading, mainly cream bract leaves with linear divisions in the upper half. 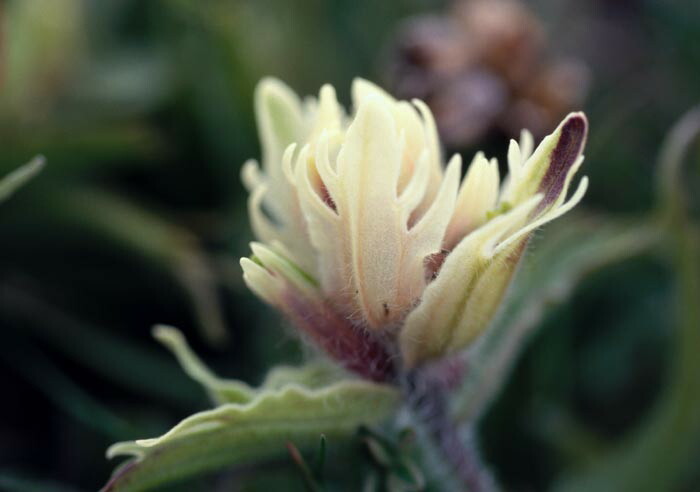 Left, side view of a developing flower showing a fused, purplish calyx divided into glabrous cream sepal lobes at the apex. Aiken 99–068. CAN. • Close-up of expanding inflorescence. Inflorescence with flowers opening. Exposed greenish styles and green stigmas protrude above the expanding sepal lobes. Aiken 99–068. CAN. • Close-up of expanding inflorescence. Inflorescence with opening flowers that have exposed styles with two-lobed green stigmas protruding above the expanded sepal lobes that are pink at the base and cream on the segments. In the right-hand flower, the three deep purple units are the tips of the folded petals that become the landing platform when the flower opens. Aiken 99–068. CAN. • Arctic Island Distribution.